When I was a kid thinking about anything past the year 2000 was difficult to comprehend. It seemed eons away as I entertained the thought while enjoying running around playing with family and friends while we laughed as we tried to catch lightening bugs before our folks called us home for the evening. This month’s Amy Warden Soap Challenge involved making soap with someone who doesn’t make soap and this collaborators thing intrigued me. Now my friend Cindy is not only a dear friend but she is one who loves a challenge. I remember introducing her to embroidery and cross stitch by inviting her to make a Walmart run with me. I was on the hunt for Bucilla kits. Having successfully completed several of the kits I was driven to find more of these relaxing pass time crafts. I asked Cindy to come along to help me suss out locations that carried the kits. We found a Walmart in San Dimas that had a healthy stock of bucilla kits. I bought pillowcase kits, table runner kits, tissue box holder kits and tons of colorful floss. Cindy bought one kit. A bucilla kit that once complete could be a small table cloth or with batting and backing added could be quilted. Cindy made it a quilt. This was a lot that could easily have taken a couple weeks to finish. Cindy finished it in 2 days. She said once she started she felt compelled to continue stitching. She did this over a weekend. So yes she a tad competitive. When I asked Cindy if she was interested in making soap once she stopped laughing she said yes so we made a soaping date. I had her Google handmade soaps to help her with ideas for technique, design and scent. She mentioned she was interested in making a lemon soap with goatsmilk and basil. Totally doable I told her. 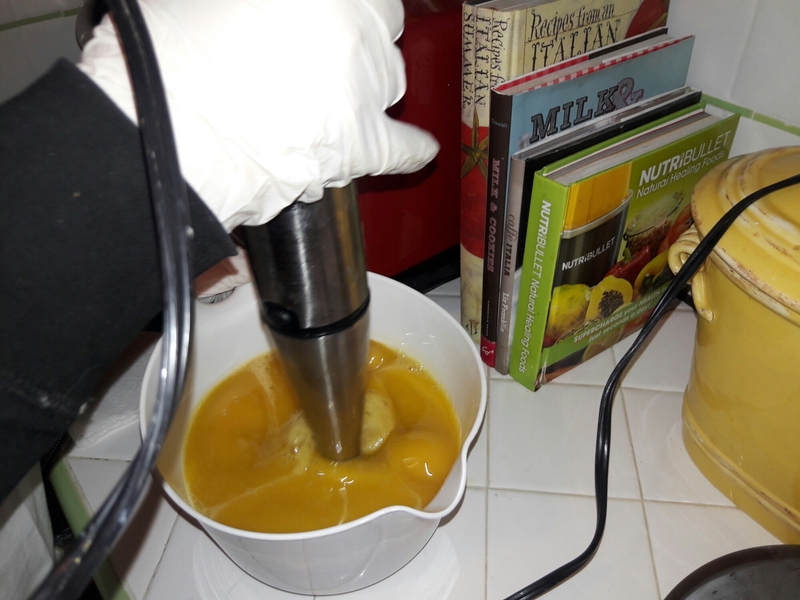 Having made several successful batches of soap where I substituted in fresh lemon juice for all water. I decided to try and get most of the ingredients for this challenge in grocery stores and markets nearby. Here is a pic of locally sourced ingredients. The only items not purchased locally were the babassu, cocoa butter and the basil essential oil. My goal was to show my friend that she could make a good soap with items from grocery stores in her area. She chose the hang it (hanger swirl) bag. Here is hanger swirl demo. Cindy showing respect for the LYE. 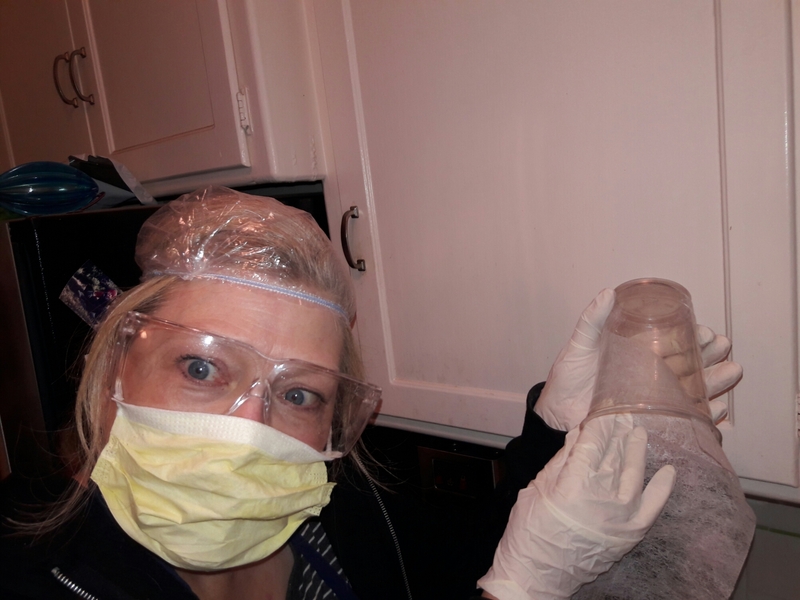 Here Cindy wipes the plastic cup(used to measure dry lye) down with a dryer sheet to reduce the “dancing lye crystals” show and burn. Sprinkling lye crystals into slushy cold fresh lemon juice. This is how the batter looks when the lemon juice and oils “both cooled to room temperature” began to hook up! At light trace Cindy separated her batter into 2 cups with main portion of batter left in the bowl. 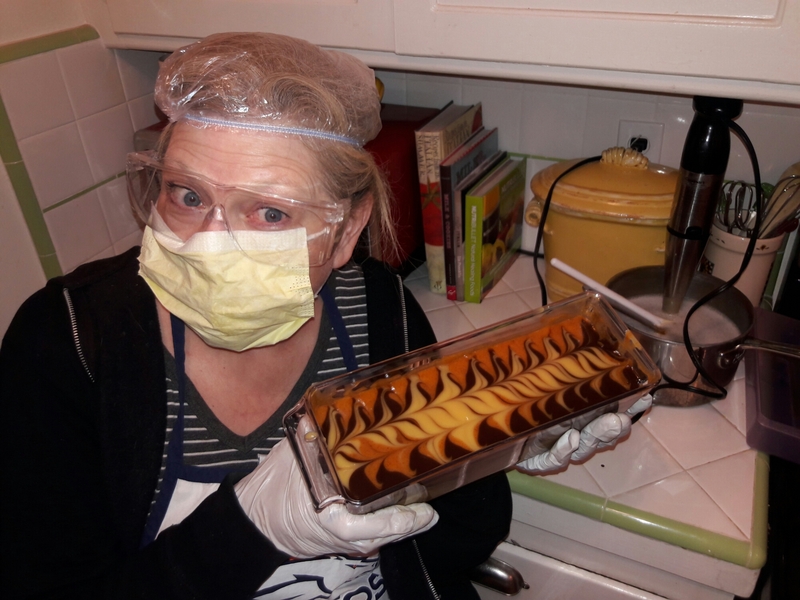 She used natural colorants turmeric and cocoa powder. The main batter was not colored. In past batches of 100% Lemon juice soap I’ve noticed the lemon juice usually makes a nice off white cream color. After pouring of the cups she saved a small portion of batter to decorate the top. Decorating the soap top using a chopstick to pull the colors into swirls. After a 2 day sapononap here is the cut. Cindy cut some bars with the ripple cutter and some without. The soap is scented with lemon, grapefruit and basil essential oils. Colored with turmeric and cocoa powder. The addition of goat’s milk yogurt cocoa butter and a bit of cumin (black seed oil)to the batter make this soap a luxurious decadent body treat. She has put them up to cure out for the next four weeks. We had a very fun time hanging out, laughing a lot and making a wonderful batch of friendship Soap. We also shot some footage that we hope someday to edit into a video to share so check back. Thanks to Amy Warden and Kenna for hosting this fun Collaborators swap.